Synthetic peptide corresponding to Human AK2 aa 1-30 (N terminal) conjugated to Keyhole Limpet Haemocyanin (KLH). WB: CEM cell lysate and mouse kidney tissue lysate. IHC-P: human hepatocarcinoma tissue. This antibody is purified through a protein A column, followed by peptide affinity. Our Abpromise guarantee covers the use of ab37594 in the following tested applications. WB 1/1000. Detects a band of approximately 26 kDa (predicted molecular weight: 26 kDa). Present in most tissues. Present at high level in heart, liver and kidney, and at low level in brain, skeletal muscle and skin. Present in thrombocytes but not in erythrocytes, which lack mitochondria. Present in all nucleated cell populations from blood, while AK1 is mostly absent. In spleen and lymph nodes, mononuclear cells lack AK1, whereas AK2 is readily detectable. These results indicate that leukocytes may be susceptible to defects caused by the lack of AK2, as they do not express AK1 in sufficient amounts to compensate for the AK2 functional deficits (at protein level). Defects in AK2 are the cause of reticular dysgenesis (RDYS) [MIM:267500]; also known as aleukocytosis. RDYS is the most severe form of inborn severe combined immunodeficiencies (SCID) and is characterized by absence of granulocytes and almost complete deficiency of lymphocytes in peripheral blood, hypoplasia of the thymus and secondary lymphoid organs, and lack of innate and adaptive humoral and cellular immune functions, leading to fatal septicemia within days after birth. In bone marrow of individuals with reticular dysgenesis, myeloid differentiation is blocked at the promyelocytic stage, whereas erythro- and megakaryocytic maturation is generally normal.In addition, affected newborns have bilateral sensorineural deafness. 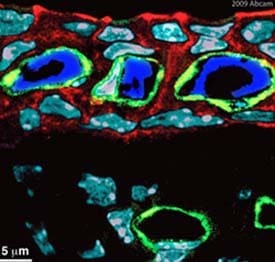 Defects may be due to its absence in leukocytes and inner ear, in which its absence can not be compensated by AK1. Belongs to the adenylate kinase family. AK2 subfamily. ab37594 at 1/100 dilution detecting AK2 in inner ear (cochlea)-stria vascularis cells from mouse. AK2 (dark blue) is specifically expressed in the lumen of the capillaries and terminal blood vessels (stained green with isolectin) of the stria vascularis in the mouse cochlea (at postnatal day 7 (PN7)). Blood vessels in the spiral ligament do not contain AK2. Blood vessels in the spiral ligament do not contain AK2. Cell nuclei are stained in light blue by Hoechst staining. Actin is stained using TRITC conjugated phalloidin. 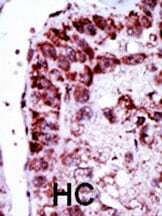 Immunohistochemistry (Formalin/PFa-fixed paraffin-embedded sections) analysis of human hepatocarcinoma (HC) tissue labelling AK2 with ab37594 at 1/50. A peroxidase-conjugated anti-rabbit IgG was used as the secondary antibody, followed by AEC staining. Anti-AK2 antibody (ab37594) at 1/100 dilution + Mouse kidney tissue lysate. Additional bands at: 55 kDa, 60 kDa, 75 kDa. We are unsure as to the identity of these extra bands. Publishing research using ab37594? Please let us know so that we can cite the reference in this datasheet. Hi could you please tell me the concentration of this product: AKT antibody, # ab37594. I'm interesting in purchasing it. The Anti-AK2 antibody (ab37594) is provided as a protein G purified fraction with a concentration of 0.25 mg/mL. inner ear (cochlea) - stria vascularis.